Queen Cleopatra was the Queen of Egypt from 51 to 30 BC. Queen Cleopatra is also the Queen of Slots! This bad boy from Novomatic is just like Book of Ra, except Queen Cleopatra is the most famous character on these reels! Based on the theme of ancient Egypt, Novomatic’s Queen Cleopatra slot game is far from unique. However, it’s based on a formula that’s known to work and is loved by players all over the world! Ancient Egypt is one of the most popular slot themes out there. Many developers make games based on this theme and players love it! The ancient Egyptians had such a unique and interesting culture which continues to fascinate people. They worshipped cats, built pyramids and mummified their dead. What’s not to find fascinating about that? 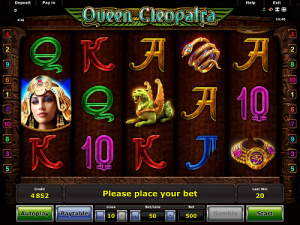 Queen Cleopatra was said to be beautiful and boy is she in this Novomatic slot game! She features on the reels along with many other symbols that have been inspired by this ancient culture. You’ll see hieroglyphic-style symbols, jewellery, statues and more! The background of this slot looks pretty simple. In fact, it could be the side of a pyramid! Hieroglyphic carvings can be seen on the columns which stand to either side of the 5 reels. Each reel has three positions and there are 10 paylines. The paylines are labelled with colourful numbers and the logo is also colourful! This makes them stand out from the stone-coloured background. You can win Free Spins, you can gamble your payouts and you can play without clicking by using the auto function. Any fan of Novomatic’s Book of Ra slots will go crazy for this Queen. Well, actually, in Queen Cleopatra, it takes two to get a payout. Two matching symbols that is! This rule applies to all of the picture symbols as they give out payouts when you match two or more symbols in winning positions. The card symbols give payouts for three or more matching symbols in winning positions. Watch the reels as they spin to see if the symbols will land where they will give you a win! Keep your eye towards the left of the reels, as the 10 paylines pay from reel 1 towards reel 5 (left to right). Matching symbols will be in winning positions if they land on separate reels, successively, following the path of one or more paylines. Some paylines run horizontally (meaning that matching symbols will have to land all on the same row for these to give wins) and some run diagonally and some take unique paths. You can see the path of each payline on the paytable and the numbers to each side of the reels show you where a payline starts and where it ends. The biggest wins are given for the matches that follow the whole payline (across all 5 reels). Some symbols are also more valuable than others. There are: 10, J, Q, K and A, a golden snake bracelet, a golf and purple necklace, a winged wild cat statue, Queen Cleopatra and a golden book! Novomatic love to add Free Games features to their slots. In Queen Cleopatra, this feature works just like Book of Ra. From three matches in scatter positions, the book will give you a payout and trigger 10 Free Games. Before the Free Games start, the book will open and the game will flick through the pages before landing on one which will reveal the ‘Special Expanding Symbol’ for the duration of the Free Games. This symbol will not only pay in Scatter but it will also expand to cover the whole reel it lands on (when there are enough for a win, so 2 or more for picture symbols and 3 or more for card symbols) to effectively multiply the payout! You can gamble your payouts in the Free Games, just like you can in the normal games, so long as you are playing manually and not with the auto function switched on. If you’re going to be playing for a long time, this feature is pretty useful and will save you from a lot of clicking! If you’re into the Book of Ra slot games from Novomatic, you might want to play this one instead. It’s exactly the same and has a higher RTP (96.12%)!